Most manmade swampy areas have similar features such as shallow water, flooded areas of wetland plants, a channel from the old river/stream, a dam and remnants of some industry that was located on it. Access is usually available through unimproved areas that are hand launching small boats only. In these swampy, shallow areas, a low draft jon boat with a small motor is king. Some areas are so shallow that using a motor will stir up the bottom too much, and a paddle or push pole has to be used to make your way around. When going about fishing them there is one really important thing to keep in mind and that is weight. The more gear you bring the more water the boat is going to draft and when inches matter, (that’s what she said) any extra weight will be a hindrance. Also make sure you evenly distribute the gear so the boat is as level as possible. Fishing these swamps can be as fun as anywhere and there are certain things you can do to be more in the know when you go to fish them. A good thing to do is venture out right after ice out when the weeds are gone. This will give you a good idea if there are any deeper areas, where the structure is located, and if there appears to be any hidden paths to other sections. Some lakes that are close by can sometimes be interconnected through a flooded area and by having all the weeds, leaves and camouflage gone; you may be able find that route to a more isolated section. These sections may be only accessible during times of high water. Sometimes the shoreline cover and structure may look the same all around the area and it can be easy to lose a favorite spot. In this type of situation putting a waypoint in your GPS is a handy trick to getting you back to the general area. Try to avoid marking plants with a ribbon, soda can or any other object that might reveal your hotspot. Swamps may look inviting, but there are a few things you should look out for. These areas usually have a high productivity and are nutrient rich, weed growth can be rampant. We all wish we could walk on water, well in a lake full of Fanwort (Cambomba Carolina) or Watermilfoil (Myrophillum spp.) you almost could. The large amounts of shallow water and cover are great nurseries for not only small fish but also bugs such as mosquitoes, gnats, flies and a host of biting and/or stinging insects. So bug repellant is a must, especially on non windy days. Wading in these places can be treacherous. Even though there are some nice sandy areas here and there, a lot of times you will be trudging through mud, mud so deep that you will sink in more then there is water. People have gotten stuck and needed help to get out thanks to suction. So, if you are going to go for a stroll around one of these places bring a wading belt and staff since you will really want to know where you are going to be stepping. Also if you intend on wading with no waders, watch out. The mud will usually hide obstructions that can cut and leave an open wound to infection. Also, lots of little “funkys” like leeches live in the mud. You may emerge to find that you have acquired a few new parasites that want to come along and fish with you. An area like this is made to punish fishing tackle. My personal preference for fishing these swampy, unforgiving areas are heavy to extra heavy power rods, strong 30-50lb. braided fishing line and aluminum framed baitcasting reels. Why this gear, let me explain. Heavy to extra heavy action rods have the backbone required to set the hook and muscle out fish that like to bury themselves into thick weeds. Braided line since there is no stretch and comes in a smaller diameter then mono allowing you to fit more on your spool. Also when a fish hits, there is no stretch and you can get a rock solid hookset, even in the thickest stuff. Finally aluminum framed reels that can better handle the abuse and keep all the moving parts aligned. Lure selection is equally important. Let’s start from the top and work out way down. First lure you always want to carry is a weedless frog. These lures are designed to go over the tops of the weeds and can be very useful for covering water to find a “hot spot” in an area. If your frog is not producing, then I would switch to either a light jig or worm. Start by pitching and flipping to natural holes that form in the weeds, and with the lures being light, the slow fall will keep it in their strike zone longer. Then try swimming it over the weeds, keeping it right under the surface where it can make a wake. When neither of these tactics works, then try to target heavy cover. This is where heavy baits ¾ to 1 oz. lures come in handy. Setting a slow drift, I pitch a 1oz. trash bomb rig or an extra heavy jig in any and all cover I can find. Remember weeds don’t always grow straight up, some fan out creating holes and pockets that are obscured from view. If nothing is producing, that is when you want to start experimenting; perhaps you may discover a new lure that works. If a fish is caught, throw out a marker buoy and work the area well. Fish could be schooling and you may have just found them. When fish are located, it is important to take an assessment of your surroundings. Did the fish strike in the Lily Pads, in the Pondweed or by wood? Fish will sometimes have a preference to certain types of structure that they will hold to, so checking spots with similar features is a good idea. Just because the fish stop biting, does not mean they are gone. Fish are very aware of their surroundings and if there is a lot of disturbance it may turn them off for a bit. The best strategy is to just leave the spot alone for a bit and come back to it. Now it may take a few hours, but patience will pay off. If you put everything together, you will have a solid plan and strategy to fish the swampy areas. During the summer it may get frustrating, but don’t give up, that big one is only a hookset away. 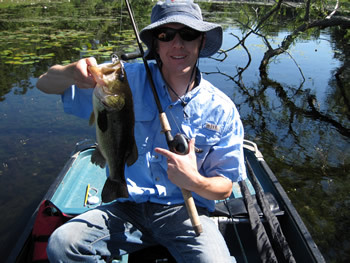 Have you ever been a guided bass fishing trip? If you haven’t, you might be missing out on some of the best fishing around the country. While the rest of us are holding down the typical 9 to 5 job, these guys are on the water almost every day… they have to… because it’s their job. Now before you head out and book a trip, take some time and do your research. When selecting a guide, ask for references and make sure to contact them and find out how they liked their fishing experience. Not all guides were created equal and some should seek another line of work. Bank fishing or as some call it shore fishing, is where most of us started out fishing as kids. Today more fishing tips and techniques are targeting anglers who fish from a bass boat, than from the bank. It’s pretty safe to say that not every fishing enthusiast owns a boat, or even knows someone that owns a boat. For those anglers shore fishing is the best option. In our bank fishing guide, we’ve outlined some key factors that will help you get the most out of your next fishing trip. Bass fishing during the post-spawn is a great time to “walk the dog” using topwater baits such as an XPS Slim Dog, Zara Spook, Lucky Craft Sammy, etc. Here’s a quick video that teaches you the basics of walking the dog with a few helpful tips and tricks that you can use the next time you are out fishing for bass in the post-spawn period. It’s a great technique that everyone should learn.